- Stars have a colored circle inside. - A star can be paired with a person. - A star can serve a more general (decorative?) purpose. This design is older and was generally used in Egyptian art, but in the Greco-Roman period they more closely resemble Voynich stars. There are some differences as well though. The most obvious one is that the Egyptian stars have five points, while Voynich stars sport from six to nine appendages. I only did a quick check, but it seems that seven and eight are standard, nine is less frequent and six is exceptional. The Voynich stars represent a different tradition altogether. The Voynich stars started out as five-pointed stars but were copied carelessly, which would explain the variation. The Voynich stars started out as five-pointed stars but were altered consciously by later copyists because the five-pointed star had taken on a specific, different meaning. The number of points on the star has a significance, and the possible values for this meaning ranged from six to nine. Did anyone study the variation in the number of points on the stars more in depth? Have better parallels been found elsewhere? Another interesting illustration. Do you think it more likely that the VMs author had knowledge of that Egyptian illustration or had personally seen a starfish? Possibilities 3 and 4 are contradictory. Do five-pointed stars convey some meaning in the VMs or not? Yes, indeed, this has all been examined before. Do the number of points indicated the star's magnitude?, for instance. Various interpretations have been proposed, but nothing has done much to clarify these details, IMO. I can only suggest Pelling or other blog sources. (27-06-2016, 08:31 PM)R. Sale Wrote: You are not allowed to view links. Register or Login to view. Another interesting illustration. Do you think it more likely that the VMs author had knowledge of that Egyptian illustration or had personally seen a starfish? The thing is that I don't really think MS Beinecke 408 had an "author". It had one or likely several copyists, who copied one or several documents in which the Egyptian illustrations had been preserved. It's also not a matter of just this illustration. This was just the way stars were drawn in Roman Egypt. 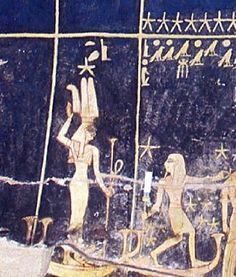 The following is a detail from the ceiling of Seti I's tomb - he died in 1279 BCE! You can already see the stars, but they look much less like the ones in the Voynich. So far, the "starfish with circle" look is most striking in the Greco-Roman period, which is roughly from 300 BCE to 300 CE (no exact dates, but this is the sweet spot). Such stars were found everywhere in Egypt, and also Greeks or Romans writing there in, say, the second century, would have known them. The problem is: these stars always have five points, like the starfish. Voynich stars usually have 7 or 8 points. Hence my question if anyone has found stars that offer a better match. Now what if the stars are not stars at all, but symbolize something else? 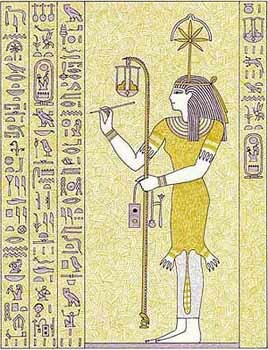 The following is the goddess Seshat, symbol of wisdom, knowledge, writing and various sciences. The "star" above her head has seven points, and is connected to her by a "string", which is something she has in common with Voynich stars. Only, this is no star, it's a plant used to make writing materials. Seshat was often depicted tallying the years, and was associated with the duration of the reign of kings and so on. - seven-pointed stars, which in some cases could be interpreted as eight-pointed if the beginning of the "stem" is seen as another leg. - a line that connects the "star" with the person. Even more interestingly, given the fact that she is very often seen tallying the years and was associated with the duration of a king's reign, it is not such a stretch to take a the Voynich figures connected to "stars" as representing specific years. Of course, there are still differences. For example, the line that connects Seshat to the star is straight, while in the Voynich they are bendy. This could be explained by the fact that this material must have been copied a few times in between the time when it was first made and the 15th century copy, but that is impossible to prove. But for now that is something I keep in mind, until someone finds a better tradition. That the nymphs connected to stars might represent years, and that there is some evidence to be found in (Hellenistic) Egyptian tradition. I've actually counted all the nine-pointed stars. There are 17 in the Zodiac section, 5 in the Stars section at the end (f103 through f116), but only 1 on bifolio 67-68 - it's the star labeled cPhocThy on f68r1. While I haven't counted the six-pointed stars, I'm pretty sure they're more common than eight-pointed stars, and definitely more common than nine-pointed stars. I've wondered for a long time whether the number of points on a star has any symbolic significance or not. It's hard to know, but it does seem that the number of points on each star was something that the illustrator cared about, although that could just mean that he was preserving the number of points present in the original (since I think the illustrations are basically copies). Thanks, Sam. My estimation of the number of points was a very rough one, so I appreciate the corrections. From six to nine, that's quite a spread. My impression of the imagery is that every line matters, so my intuition would be too that the number of points has some significance. I'd find it weird if someone had to draw dozens of stars and by accident varied the points between six and nine. Thoth made note of the quantity and Seshat verified the figures. Are you saying that her headdress is a papyrus plant? The Larousse Encyclopedia says she wore a star on her head. Saying nothing of any potential separation. But also saying that the star was 'inscribed in a reversed crescent' And that the star and crescent were 'surmounted by two long, strait plumes'. This construction is then a representation of the ideogram for secretary. And then, you'll love this, it says "Later, due probably to a misunderstanding on the part of the sculptors" her headdress got turned into a pair of long, drooping horns. So it was altered - beyond recognition - before it ever got out of ancient Egypt. So how does the VMs author get to see the inside of Seti I's tomb? More likely that a modern young man in Rome, some time after the parchment dates, gets a bit of Egyptian influence from seeing the carvings on one of the Egyptian obelisks taken to Rome a millennium prior. And rather than a series of sloppy copies, the carved images themselves may have become somewhat worn and too far up the pole to be seen clearly. Or are you suggesting that the VMs is really the nth iteration in a series of copies that goes back to where?? Seti's tomb? Your alternate suggestion, surviving artifacts like carvings that were recovered later, is more or less what happened when the Aratea manuscripts were made in the 9thC. They looked to surviving art from antiquity to illustrate Aratus' text. This is a possibility, though I am thinking more of an uninterrupted line scenario. Though not until Seti's time. Like I said, when I show such early examples it's just to illustrate that they belong to a tradition and would have been part of the artists' vocabulary. I usually try to find at least one example from 300 BCE onwards, which is when we start getting a mixture between Greco-Roman and Egyptian cultures. (27-06-2016, 11:20 PM)Koen Gh. Wrote: You are not allowed to view links. Register or Login to view. Your alternate suggestion, surviving artifacts like carvings that were recovered later, is more or less what happened when the Aratea manuscripts were made in the 9thC. They looked to surviving art from antiquity to illustrate Aratus' text. That, and various other details in the fold-out, not leas that enormously important image of the bearded sun, is why I attribute the origin of that section to the late Achaemenid-early Hellenistic period, though like every other it retains traces of subsequent history and travels. I really liked the look of work begun by .. was it Darren or Marco... correlating the imagery to Alfonso's star-maps. Not sure why the author stopped. It looked very promising. I would suggest that anyone interested in the subject be aware that many of the 'Arab' star-names are not the indigenous ones, but late (9th-10thC) renderings into Arabic of the Latin descriptive terms, with some few of the older indigenous ones (such as Thurayya for the Pleiades), and others again which come from Syriac - such as "al-Gabbar" for Orion. The "al-" is an Arabizing element, but Gabbar itself was Syriac. Hope that's not too OT. I noticed that the Egyptian stars are very formal in their having five points. 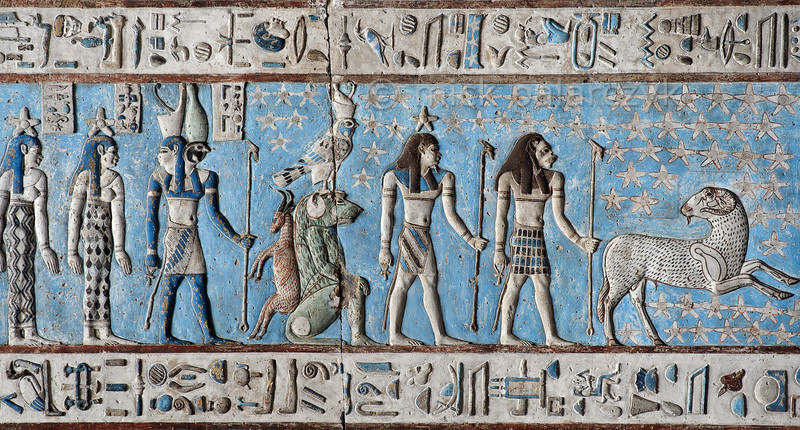 That is why I find an altered version of Seshat symbolism more promising, since she would account for seven and eight pointed stars and a connecting line. It would also allow for the nymphs to be read as years rather than actual stars.